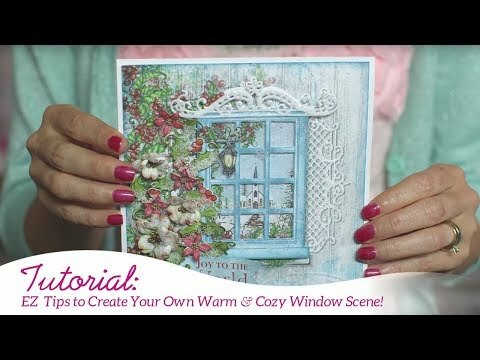 Watch this tutorial for tips on using the Winters Eve Window Frame here. Instructions: Create a 5" x 7" card base out of white cardstock. Cut a piece of designer paper from the Classic Wedding Collection to 4 3/4" x 6 3/4" and sponge edges with Butter ColorBox Chalk Ink. Die Cut using square window die from the Window Frame Die set. Add pop dots to the back of the paper. Also die cut the bridal couple image using the same square window die and add Flower Soft to the bridal bouquet and a touch of Angel White Glitter to the bride and white pillars with Dries Clear Adhesive. Out of white cardstock die cut the three decorative dies, cutting the one in half to create shutters, from the Window Box Elements Die set and then sponge edges with Starlite Silver Brilliance Ink. Using gray Classic Wedding designer paper die cut the window box and the flower arranger using the Window Box Elements dies. Assemble and sponge edges of window box with Gray Whale Chalk Ink. dhere bridal image, window pane, window frame and decorative window pieces with pop dots, 3D foam strips and Dries Clear Adhesive, as needed. Adhere flower arranger inside flower box with Scor-Tape and then adhere flower box to card front with Scor-Tape. With Tuxedo Black Memento Ink on White Cardstock stamp the two types of leaves and the two types of flowers from the Window Box Fillers Stamp Set, stamp the roses from the Classic Rose Stamp Set and stamp the wildwood florals from the Wildwood Florals Stamp Set. Die cut all with coordinating dies. Color some of the leaves using New Sprout Memento Ink with Bamboo Leaves Memento Ink accents and color the other leaves with the combination of Pistachio Memento Ink and Olive Grove Memento Ink accents and then add a touch of Pearlescent Olive Ink. Color flowers with a combination of Cantaloupe Memento Ink, Tangelo Memento Ink, Butter Chalk Ink, Pixie Dust Chalk Ink, Mango Madness Chalk Ink and Pearlescent Rust Ink. Shape flowers and leaves using the Deluxe Flower Shaping Kit. Cut flowers and leaves apart as needed and arrange in the window box. With Dries Clear Adhesive add Angel White Glitter to flowers. Add Nuvo Crystal Drops in Ripened Pumpkin, Dandelion yellow, Copper Penny and White Blizzard to flower centers, as desired. Adhere Silver Rhinestones and White Pearl as shown.